Reports suggest that Apple is getting closer to implementing MicroLED in its future product releases, including the Apple Watch, with the display technology potentially offering a number of benefits compared to other methods. AppleInsider explains how the current TFT and OLED display technologies work, and how MicroLED differs. MicroLED shows promise as a display technology, potentially offering power savings and a reduced screen thickness when put beside current-generation display panels. Apple has recognized the potential, and has invested heavily into developing the technology over the last few years, with a view to using it in the company's future products. To understand fully how MicroLED can benefit Apple, it is worth understanding how the commonly-used display technologies work in the first place, before examining how different MicroLED really is in a comparison. The most common display technology used by consumer products today, and the oldest of the technologies examined in this article, TFT's full name of TFT LCD stands for Thin-film-transistor liquid-crystal display. 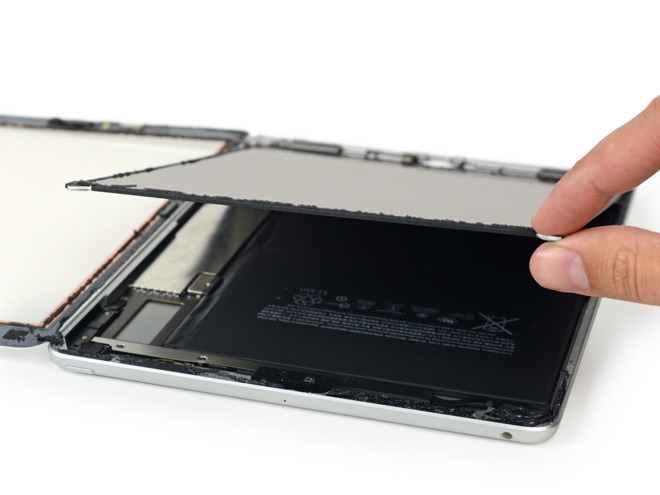 This technology is extensively used by Apple in its products, found in iPads, iPhones, MacBooks, and iMac lines. The LCD part relates to the concept of defining small translucent or transparent areas in a thin and flexible liquid crystal-filled panel, like the displays used in calculators. Passing current through the segment changes the molecular properties of the defined segment area, allowing it to switch between being see-through or opaque. TFT takes this a stage further, by effectively covering an entire panel with a grid of isolated liquid crystal segments, which again can vary between opaque and transparent based on the level of electrical current. In this case, there are far more segments needed to make up the display than with a normal calculator. Three neighboring segments can be used to create a single pixel, with color filters used to change the light passing through to red, blue, or green. By varying the charge applied to each liquid crystal segment, the three combined can be used to generate a wide variety of colors and at different brightnesses. Polarizing filters on either side of the TFT display sandwich are used to prevent light from passing through directly, with the liquid crystal reaction of each segment affecting polarized light passing through the first filter to go through the second. Sometimes these types of display are known as "LED," but this somewhat of a misnomer, as this actually refers to the use of Light Emitting Diodes as a light source. The LED backlight shines light through the various layers making up the TFT LCD. Displays that use collections of LEDs as individual pixels do exist, but it isn't usually found in consumer products. LED screens are commonly used for billboards, in attractions, and as a large-scale display for events. TFT LCD screens continue to be widely used in production for a number of reasons. Manufacturers have spent a long time perfecting the production of the display panels to make it as cheap as possible, while its high usage allows it to benefit from economies of scale. Used in consumer devices in a similar way to TFT LCD, OLED (Organic Light-Emitting Diode) is a display technology that is similar in the basic concept, but differs considerably in its execution. Again, the idea is for a thin panel to be divided up into segments, with charge applied to each section to alter its molecular properties, but that's where the techniques diverge. As the name implies, OLED uses an organic compound film that is put between two electrodes, which are used to provide charge. Instead of the charge changing how light passes through, the current instead causes the emissive electroluminescent layer to emit light, without the need for a rear light source. These self-emitting pixels gives OLED a considerable advantage over LCD-based systems in a number of areas. 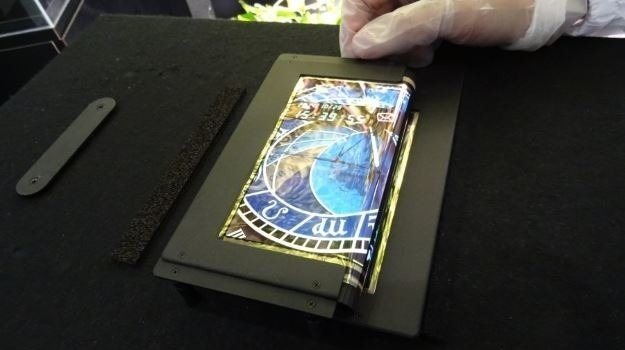 Most obviously, by not needing a backlight, OLED panels can be made far thinner than an equivalent LCD-based display, allowing for the production of thinner devices or more internal area for other components, like a larger battery. The power efficiency of OLED panels can be far greater, as while a TFT screen requires an always-on backlight, the brightness of OLED pixels themselves determine power usage, with a black pixel consuming no power at all. OLED screens are also faster to respond than LCD displays, making them more useful for VR displays, where response time needs to be as rapid as possible. This also allows OLED to provide superior contrast ratios compared to TFT, as the lack of backlight bleed-through that occurs in TFT simply doesn't happen in OLED. OLED also can be produced on plastic substrates instead of glass, allowing it to be used to create flexible displays. While this is currently embodied in curved and other non-flat screens in some devices, it has the potential to be employed in foldable smartphones or rolled up for storage, an area Apple is also allegedly examining. Despite the advantages, OLED is still lagging behind TFT in terms of adoption. The cost of production is far higher, in part due to the need for extremely clean environments, as a single speck of dust can potentially ruining a display during fabrication. OLED panels are also affected by the presence of water, both in production and in use. Small amounts of water contacting the organic substrate can cause immediate damage to the display, rendering parts of the screen useless. So far, Apple's usage of OLED consists of the premium iPhone X and the Apple Watch. 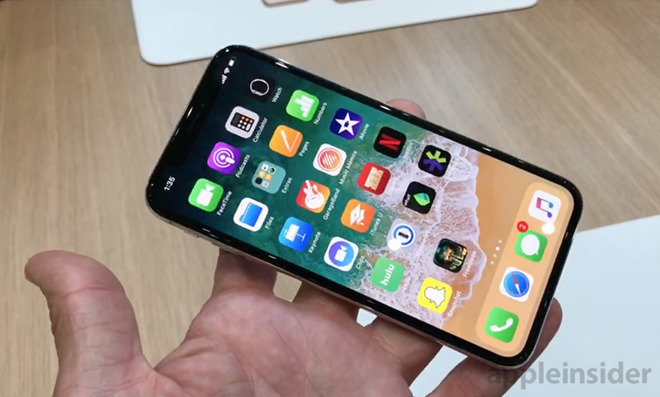 As the cost of production drops down, it is plausible for Apple to use OLED in more future products, providing a better screen for customers to use. Thought to be the next big thing in display technology, MicroLED basically takes the idea of using LEDs for pixels in a large stadium-style screen and miniaturizes it all. Using extremely small LEDs, three MicroLEDs are put together to create each pixel, with each subpixel emitting a different color from the usual red, blue, and green selection. As each LED emits light, there is no need for a backlight as used in TFT screens. MicroLED doesn't use an organic compound to produce light, making it less susceptible to failure compared to OLED. Just like OLED, it can be applied onto a flexible material, allowing it to be used for curved displays or non-stationary components, like a watch strap, and can result in an extremely thin display panel. MicroLED offers the same lower power consumption and high contrast ratio benefits as OLED when compared to TFT. However, MicroLED is also capable of producing a far brighter image than OLED, up to 30 times brighter, and is in theory more efficient in converting electricity into light. As a relatively new and in-development technology, the cost of MicroLED production is extremely high in comparison to the more established OLED and TFT mass production lines, in part due to lower than required yields. Manufacturing equipment vendors have produced hardware for MicroLED production that cuts defects in half and reduces deposition deviance from 3 nanometers down to 1 nanometer, but it is unclear if this is enough to help mass production move forward. While MicroLED is an attractive proposition for Apple, it is not the only technology under development by the company's engineers. 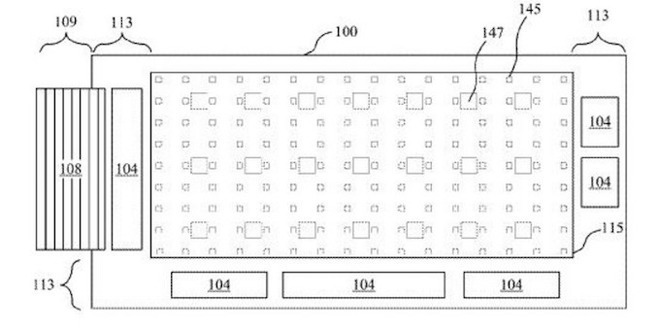 Apple has previously filed patent applications for a technology described as "Quantum Dot LED and OLED Integration for High Efficiency Displays." 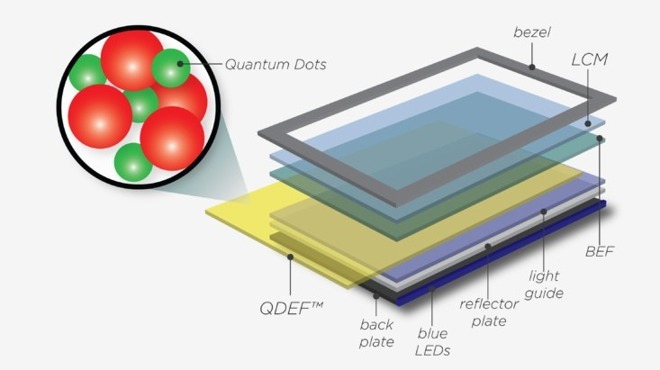 Quantum Dots are photoluminescent particles included in an LED-backed TFT display that can produce brighter and more vibrant colors, with the colors produced depending on their size. While available in current QLED televisions, the technology is only really being used to enhance the backlight, rather than being used to illuminate individual pixels. Under Apple's implementation, thought to be a "true quantum dot" (QD) system, the dot will emit light on demand without needing a backlight. For true QD, the photoluminescent dots are instead replaced by electroluminescent nanoparticles which are capable of such emissions. The technology in theory can create an even thinner display than OLED, along with a more streamlined manufacturing process. True QD displays are also capable of high pixel densities of up to 1,000ppi, multiple times the density required to be called a Retina-quality display, and based on Apple's hybrid invention, will also boast the response times of OLED technology. As is usually the case, Apple does produce a considerable number of patent applications every week that are filed with the US Patent and Trademark Office, and not everything it files will be fully commercialized. The QD patent application certainly shows Apple is thinking about display technology in multiple ways, and how it can be applied to future devices, but short of getting firm supply chain information or an official announcement from Apple directly, it is difficult to confirm which direction it will be heading. Apple has been interested in using the technology for some time now, with the first notable sign being its acquisition of LuxVue in May 2014, alongside assorted related patents. A MicroLED specialist, LuxVue was rumored to have been the display producer for the ill-fated Google Glass headset, but was also the holder of assorted patents in the LED display field, including MicroLED. At the time, the acquisition was thought to be an attempt by Apple to bring part of its display technology development in-house, with suggestions the MicroLED technology would be used in another rumored-at-the-time device, the Apple Watch. 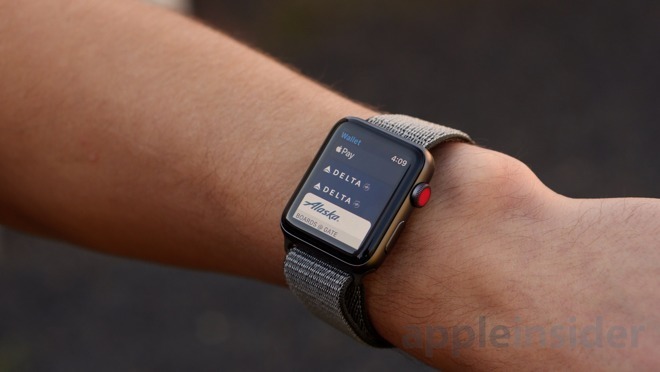 A more recent report suggests Apple is working with TSMC to make small panels for a future premium Apple Watch, potentially starting mass production by the end of the year. 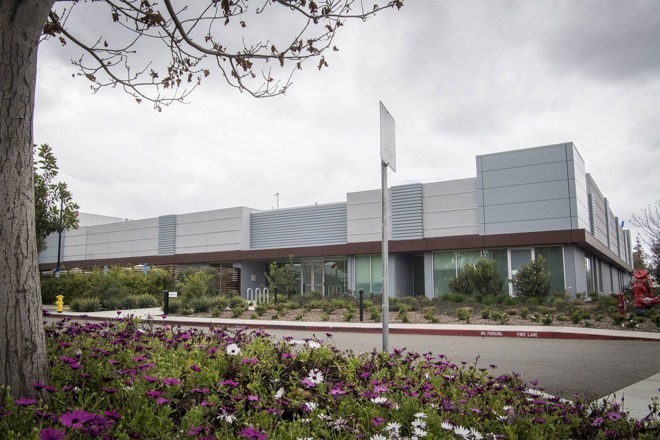 Apple's reported display facility in Santa Clara, Calif.
Apple has also reportedly set up a secret facility just 15 minutes away from Apple Park, believed to be used for developing MicroLED. The 62,000 square-foot facility is thought to house around 300 engineers on a project named "T159," relating directly to the technology's development. The facility is also claimed to be sufficient in size to perform small scale manufacturing of display panels, allowing the company to keep development and testing in-house without involving third-parties. Considering Apple's previous history in developing technologies before issuing information to manufacturing partners, it is possible that Apple is trying to work out the kinks in production before suppliers even attempt to make MicroLED panels. The rumored small screen production may be for the Apple Watch now, but it may also benefit another often-rumored device, namely the VR or AR headset. This type of hardware relies on light components to keep the weight off the user's head and neck, as well as displays with a high refresh rate and as close to perfect color reproduction as possible. Apple is also apparently planning to use the technology in larger displays, said to be bigger in size than those in the MacBook Pro lines. This could be an iMac or iMac Pro, or even an external display, but ultimately there's no real indication of Apple's plans at this point, regardless of the scale of the screen. Reports from last year also suggest Apple's investment in MicroLED was a cause for concern for Samsung, LG, and other South Korean suppliers who provide display panels for the company's products. Owning the process for MicroLED manufacturing could allow Apple to migrate away from its existing display suppliers in the coming years, reducing revenues and profits. Aside from Apple's development, there has been little in the way of announcements from other firms for products using the technology that could be bought by consumers in the coming months. The exception is Samsung, Apple's main rival in the mobile marketplace and a major supplier of display panels, but its usage of MicroLED is not aimed at producing smaller screens. 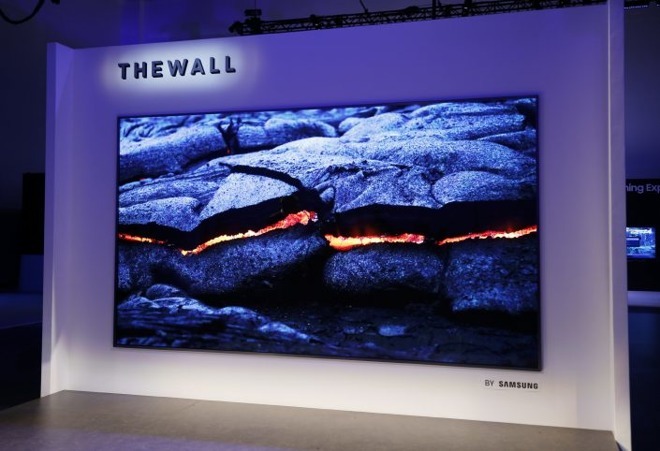 At CES 2018, Samsung introduced The Wall, a 148-inch TV claimed to be the "world's first consumer modular MicroLED" television. According to the South Korean electronics giant, The Wall's modularity meant consumers would be able to customize their television's size and shape to suit their needs. Samsung claimed at the show it will be available to buy from August, but declined to advise how much it will cost. Given the technology's allegedly expensive production using current methods, and the usual high cost associated with the company's televisions headlining at the tradeshow, it will probably be prohibitive for the vast majority of potential buyers. The impending use of the technology in a high-priced consumer product could be considered proof that MicroLED display technology is maturing enough for use in devices. If the reports claiming Apple is getting close to mass producing panels is true, the inclusion of MicroLED in the Apple Watch could end up being the first mainstream usage of the technology.